Tigger loves to bounce more than anything. Sometimes his bouncing gets out of hand, but he doesn't mean any harm. Beneath that happy-go-lucky exterior beats a sensitive, gentle heart. He bounced onto the scene in "Winnie the Pooh and the Blustery Day" (1968). The one and only. Cheerful Tigger loves to bounce all day long. Sometimes his energy is too much for the others, but he always means well. Tigger sure is energetic. He loves to use his tail to bounce all over the Hundred Acre Wood. Sometimes his bouncing gets to be a bit much, but he doesn't mean any harm. Underneath that happy-go-lucky exterior, there's a sensitive, gentle heart. A friend of Pooh's who loves bouncing more than anything else. Unfortunately, his bouncing sometimes causes headaches for everybody else. An energetic personality who lives in the Hundred Acre Wood. He loves to bounce, and has a tendency to get carried away and cause trouble for others, but he means no harm. Tigger is a friend in the 100 Acre Wood. He made his first appearance in Kingdom Hearts, alongside with Roo to train Sora how to "jump", which requires jumping on a specific tree coordinate and reach to the finish line. Tigger mostly uses Rabbit's farm as a jumping spot, therefore ruining his vegetables, much to Rabbit's chagrin. Although Tigger's original voice actor, Paul Winchell, was still alive when the Kingdom Hearts series was conceptualized, he had retired from voice acting. 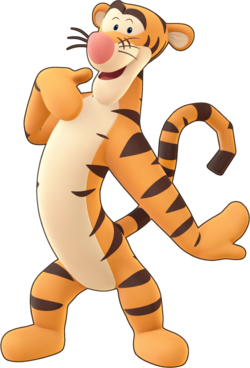 Tigger's voice was instead provided by his current official voice actor, Jim Cummings, who also voices Winnie the Pooh, Pete, Ed, and Julius in the Kingdom Hearts series. Tigger appears as a Command Board player alongside Pooh, Terra, Aqua, and Ventus. Ten years later in Kingdom Hearts, the mini-game with Tigger ("Block Tigger") takes place in Rabbit's House; Sora is required to block Tigger from jumping on Rabbit's crops. If Tigger does jump on Sora's head or shoulders, Sora earns points. There is a "Rush" function at the bottom of the command menu, which enables Sora to get to Tigger on time (i.e. before he jumps on Rabbit's crops and pushes them down). He is also in the Giant Honey Pot Area. You have to follow Tigger's exact path across the area. If you fall or go to the wrong spot, you have to start over. Then he is in the minigame "Tigger's Giant Pot", where you have to whack the nuts back at the pot. When you successfully hit the pot, Tigger leaps up in the air. Tigger also is seen before the Pooh's Swing mini-game, when you talk to him he says his bouncing spot disappeared as well as Eeyore's tail. Tigger provides Sora a new Sleight if he jumps around a stump. The Kingdom Hearts II mini-game involves Tigger and Roo, and it also takes place in Kanga and Roo's House. This game also involves bouncing, but this time, Sora is required to bounce on rows and rows of balloons. Each balloon, if burst, gives Sora a number of points (in the form of yellow orbs). Also, he is one of the few allies who helps you get through the Spooky Cave mini-game. As his name may suggest, Tigger is an anthropomorphized tiger with black-striped, orange fur covering most of his body, except for the fur on his belly and around his eyes and mouth, which is tan. His feet do not seem to have toes, and his thumbs are the only distinct digits on his hands, making it look like he is wearing some sort of blanket sleeper. He has a long chin and a long, thin tail with a flat tip (likely due to his habit of bouncing on the end of his tail). He has small, close-set, black eyes and thick, brown eyebrows. Tigger also has a large, round pink nose and three black whiskers on either side of his upper lip. Tigger has a cheerful and out-going disposition. He is very competitive (in a friendly way) and has complete confidence in himself. Although he can seem very arrogant, he has a heart of gold and is willing to do anything to help his friends. While friendly, Tigger is often found bothersome at times, as he engages Sora in many puzzles and/or games that involve his love for bouncing. Despite this, Tigger is shown to be rather illiterate, since he cannot verbally spell his name properly, shown when he says "guh" instead of "G" and "er" instead of "e-r". Though Tigger's original debut dates back to 1928 in A. A. Milne's novel, The House at Pooh Corner, this incarnation of the character first appeared in Disney's second Winnie the Pooh short cartoon, Winnie the Pooh and the Blustery Day in 1968, where he first visits Pooh at his house during a storm, introduces himself to him and leaves a cryptic warning about how Heffalumps and Woozles like honey and will likely try to steal Pooh's. In Kingdom Hearts Birth by Sleep, however, his origin is mistakenly labelled as Winnie the Pooh and the Honey Tree in 1966, even though Tigger did not appear at all in the short. This page was last edited on 12 February 2019, at 13:38.